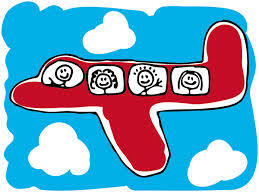 The Nappy Shop Blog: Handy Hints for Traveling or Flying with your Little Angles! Handy Hints for Traveling or Flying with your Little Angles! No need to panic! The most important thing to remember is simply this... plan ahead! Here are a few tips we've found that have come in handy while traveling with kids. If your child is old enough to carry their own rucksack, have them carry it themselves. Help them pack... Otherwise they may end up with a bag too heavy and full of toys. Make sure you pack plenty games and have already downloaded any movies prior to traveling. If your movies are still in the cloud the local device won't be able to reach it without delays and extra expenses. Pack extra snacks in case of any delays. Single-serving bags are easy to pack and dish out when on the go. Try to avoid sugar and nuts as much as possible. Bellamy's Organic have a great range of ready to eat meals and snacks to keep your little one's at bay! Sugar can have your little angles turning into devils when they don't have much room to roam. Items including nuts may not be allowed to be opened if a person on the flight has a nut allergy. Babies cry, that's just part of what they do. Some babies have an easier time flying than others, especially during take off and landings. To keep the haters at bay, try buying $10 worth of ear plugs to pass out to passengers close by. You may never need to use them but it sure is nice to knowing you have something just in case. This will help to elevate some of your stress. Talk to them prior to going through security. Try giving them a bit of an understanding of what is about to happen. With my little ones letting them know they would have to part with their favorite stuffed animal for a few seconds during this process saved a lot of headache. Either board early or last. If you have carry on luggage try to board early. If not, try boarding last. It can be hard to find a place for your carry on luggage if you are one of the last people to board. A lot of airlines have eliminated free early boarding for families. Frequent fliers, first-class and business travelers are typically in the first groups to board. Airlines do still allow early boarding for “people who need a little extra time,” but they just don’t say “families” anymore. It’s typically allowed during the first group who boards. Use it if you need it. Most importantly, just do it! Traveling can be stressful for adults and children alike. Planning ahead makes the delays and setbacks easier and more enjoyable for the whole family.